Shad hailed the legislation in his inaugural address at the Bharatiya Janata Party's national convention, which started here Friday at Ramlila Maidan. 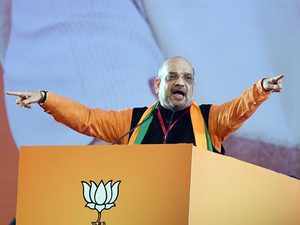 New Delhi: BJP president Amit Shah Friday said the Modi government has "fulfilled" the dreams of crores of youths with 10 per cent reservation in jobs and education for the general category poor, and described the constitution amendment bill as one of the most important legislations passed by Parliament. Shad hailed the legislation in his inaugural address at the Bharatiya Janata Party's national convention, which started here Friday at Ramlila Maidan.